Are you in need of a new airbrush kit? No matter if you are looking for the best airbrush for cakes all the way to the best airbrush for arts and crafts, we have you covered. We have spent dozens of hours testing and analyzing some of the most popular airbrush kits on the market just for you. 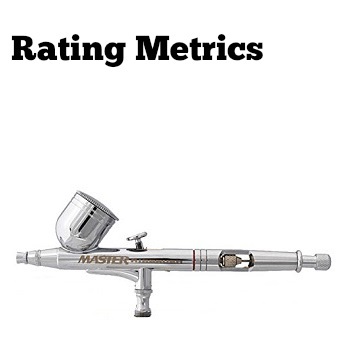 We rate the airbrushes in 5 important metrics: Performance, Features, Build Quality, Cost, and Overall Rating. We also discuss the differences between single action and dual action airbrushes, external mix and internal mix airbrushes, and gravity feed/siphon feed/side feed. 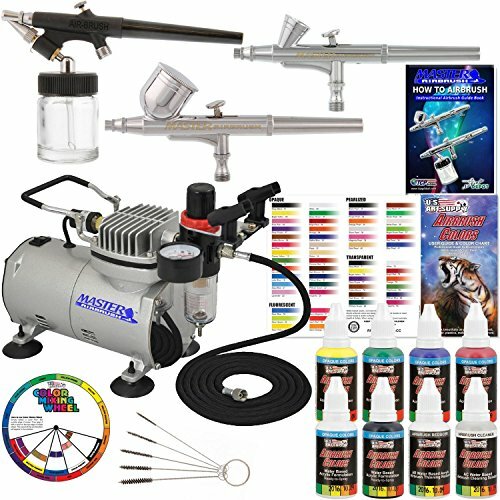 We also list our what we feel are the best airbrush kits for various applications. But for those of you who are just after our top choices, hop to the table right below. 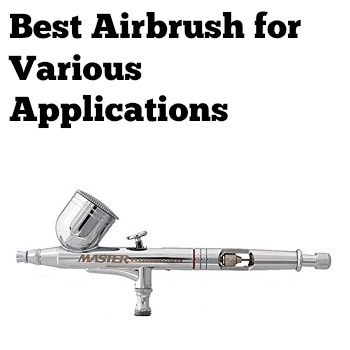 There are many great and reliable airbrush kits on the market. Below are brief overviews of each airbrush kit that we tested and reviewed. You can click on the link below the image to jump down to our full review of each product. ABEST brings to the table several different airbrush kits but most are somewhat similar in size, performance, and features. ABEST Airbrush Kits utilize a traditional design and approach that has proven effective for many years. Rather than load up the user with many features and built-in sensors, ABEST keeps things simple with their oil-free airbrush motor that may require some fine-tuning. This helps keep costs down which directly benefits you, the consumer. AW is another brand that has a relatively diverse range of airbrush product. But for this review, we will be focusing in their popular 3 Multi-Purpose Professional Airbrush Kit. This kit is a step up in performance thanks to its larger, 1/6 HP motor. As the name suggests, it comes with 3 different airbrushes that allow you to work on a variety of items of different sizes and scopes. It also comes with a cleaning brush, storage case, and more. All of this does come at a slightly higher asking price than some of the budget examples on the market. As the name suggests, Badger Air-Brush Co is in the business of airbrushes and their huge selection of kits, brushes, and paints support that claim. Their target audience seems to be those who are after a higher-end product with exceptional performance and build quality and that are willing to pay a premium price to achieve that. Some of their products are designed for specific applications such as taxidermy so you can tell that Badger has a lot of experience in understanding what people are looking for in an airbrush. Cafego sells both all-in-one airbrush kits as well as airbrush toolkits. For this review, we will be focusing on the Cafego Portable Airbrush Kit. This kit is a bit on the smaller side and designed for smaller projects such as models or face paint. It is powered by a 12V motor that has 1.6A and is capable of air output of 10 Liters/min. Overall, this is a pretty straightforward and simple unit and the competitive asking price reflects this. Comie is a brand that we had not had much experience with before this review. Their airbrush product selection is quite small, with the 3 Airbrush Kit being the only thing we have come across. However, what they lack in product choices they make up in understanding what someone looking for the best airbrush for makeup or the best airbrush for hobbies look for: a simple, effective kit that has almost everything that you would need. The handy kit is also able to still stay relatively affordable. The CNUALV Airbrush Kits are rather popular and there is a variety to choose from. For this review, we will be focusing on their arguably most popular kit, the 180K. The first thing you will notice about the CNUALV Airbrush Kit is that it doesn’t come with a motor or pump. Rather, it is intended to plugged directly into a compressed air line in your garage or warehouse. Not having a pump drives the asking price way down but for those without an external airline, it might make this kit a deal breaker right off get go. The Ebest Airbrush Kit is a smaller unit and designed specifically applications such as nailbrush art. Being a smaller unit, its power source is also smaller and this powers relatively small airbrushes that provide good control but may struggle to cover large areas. The asking price is very reasonable but you sacrifice some of the features you may enjoy in more expensive units. 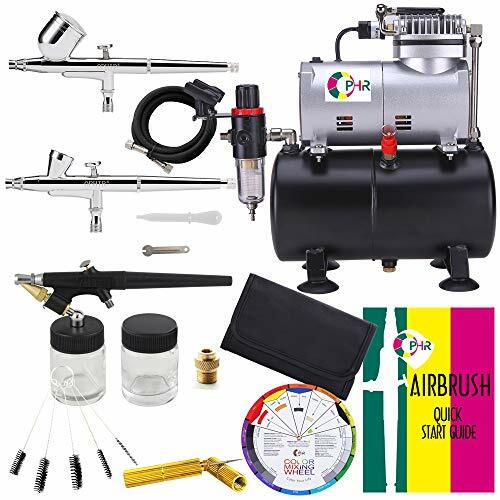 The Gocheer Airbrush Kit is another example of a product that skips the added costs and burden of an external compressor and instead is designed to work with an air hose that is already installed in your location. This makes the unit much more affordable and mobile but it also means that you will have to have an air supply for it to make sense for you to purchase. Gocheer advertises that their airbrush is designed for cake decoration, car painting, art, nail design, and more. GotHobby has a rather large selection of airbrush kits and airbrush kit accessories. Most of their products appear to be targeted towards professional-level artists who want something with increased performance and capabilities. Their Dual-Action Pro Kit bumps things up a notch thanks to its powerful compressor and loads of features. However, it does come in at a higher asking price than you will pay for many other brands. But f, r many it will be well worth the higher price of admission. 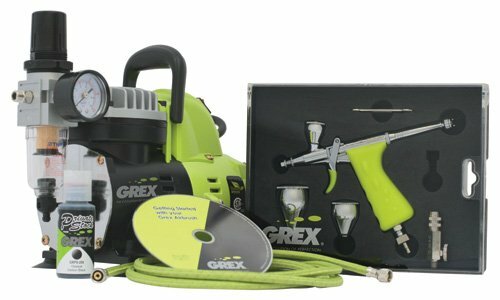 Grex Airbrush is in the business of providing high-quality, professional airbrush kits and airbrush accessories to those after the very best the industry has to offer. Their products truly stand out from the crowd thanks to their robust design, impressive performance, and great quality. We will be focusing on the popular Grex GCK03 Airbrush Kit in this review. HUBEST sells a few different types of airbrush kits but we will be focusing on their most popular one, the HUBEST Airbrush Makeup System Kit. As the name suggests, this kit is intended to be used for makeup application. This type of application doesn’t require the impressive power output and loaded features that other units may possess but it also means that this unit is also quite affordable and easy to transport. Iwata-Medea is another brand that is targeted at those wanting to experience some of the top-tier airbrushes on the market. While their products are capable of many applications, Iwata-Medea seems to focus on embracing their products for arts and crafts-related tasks. 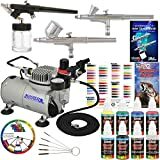 Their Deluxe Airbrush set is a sort of “all-in-one” package that includes a huge motor, quality airbrush, DVDs, stencils, cleaner, and even a variety of paints. This is great for someone who wants everything that they need in a single purchase but the asking price is quite high because of it. KKmoon might be a lesser-known company, but they offer a nice range of airbrushes and airbrush accessories, particularly in their robust line of standalone airbrushes. The kit we will be focusing on is their Professional 3 Airbrush Kit that, as the name suggests, comes with 3 proven airbrushes of different sizes to go along with the powerful compressor. The asking price is mid to high tier and is targeted at aspiring professionals or passionate hobbyists. Master Airbrush is a huge online airbrush retailer and has arguably the largest selection of airbrush kits and airbrush accessories that we have come across. They have units in all shapes and sizes and products that utilize both compressors as well as airlines. For the purpose of this review, we will be focusing on one of their best-selling kits, the Master Airbrush Professional 3 Airbrush System. It tries to compete with other professional airbrush kits while still being relatively affordable. OPHIR is another brand that offers several different calibers of airbrushes and airbrush kits. Their largest kit, the 110V Pro, caught our eyes and will be the center of this review. It is targeted at a large group that is after a proven and capable unit that can handle both small and large tasks. It comes with several different airbrushes which is always a welcome bonus. Furthermore, it also includes many different additional accessories that OPHIR hopes will make it stand out from the pack. It will be a bit higher in the asking price, however. Paasche Airbrush takes a much more elegant approach to their diverse lineup of airbrush kits and airbrush accessories. The products are very attractive looking and give off a feeling of quality to match their great performance. For the sake of variety, we will be focusing on the Paasche VL-3W Double Action Airbrush set for this review. This is a bit different than most products we have reviewed. It is powered by an airline rather than a compressor and is targeted towards those who want the very best in professional-caliber airbrushes. 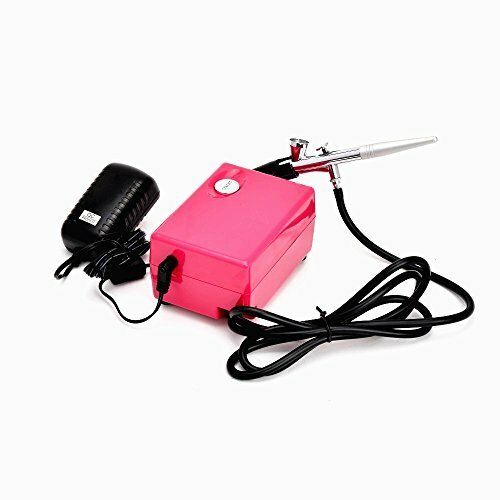 The Pinkiou Airbrush compressor makeup kit is a small and simple product that doesn’t offer a lot of power potential. However, it instead focuses makeup and nail applications (which typically require much less application pressure) and delivering it in a package that is very reasonably priced. PointZero Airbrush is another very popular online airbrush brand that really seems to focus on large kits that have everything that one would need to get started in airbrushing. They seem to try to find a happy medium between performance and usability which makes them a very attractive target company. While they offer several airbrush sets, we will be focusing one of their largest and most popular, the PointZero Cake Airbrush Decorating Kit. As the name suggests, it is intended for cake decorating but we have found that it can be used for a lot more than just that. StarsTech is another brand that has a diverse selection of airbrushes that range from the small and portable to much larger and more capable examples. 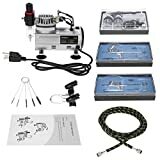 We are going to focus on one of their best-selling units which is a smaller example that is called the StarTech Cake Decorating Airbrush Compressor Kit. This is a much smaller kit that is mostly designed to be used in small applications such as decorating cakes and/or applying makeup. It has a small motor and not a lot of accessories but this results in very simple use and a very competitive price point. TYRELLEX is another brand that is taking the smaller approach and designing a product that is intended for less demanding applications such as cake decorating. Their cake airbrush certainly looks the part and stands out from nearly every other product we have tested from a looks standpoint. TYRELLEX hopes that their simple plug and play approach will win over customers from going with a product that has a more traditional appearance and approach. However, you will also pay a bit more to enjoy this opportunity. ZENY is the final product that we are reviewing in this article and it certainly is worth mentioning in this huge list. 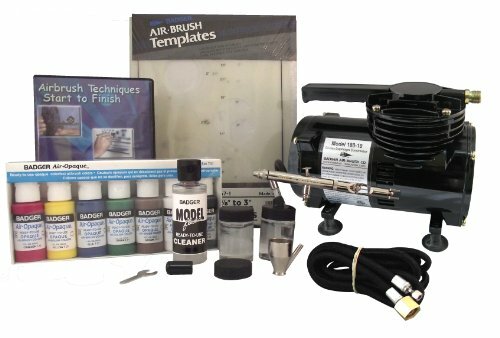 This company seems to focus mostly on standalone airbrushes but they also offer some kits as well. Specifically, we will be going over the ZENY 1/5HP Multi-Purpose Compressor Kit. This kit tries to wow us with great power output while still being reasonably priced. 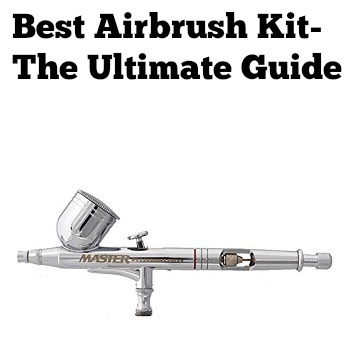 There are several components that go into figuring out the best airbrush kit for you. We break down and discuss each of those metrics in greater detail below. The performance of an airbrush kit refers to how well it does its job: being an airbrush! More specifically, we look for kits that come with efficient and powerful compressors that are capable of producing a lot of pressure and, ultimately, a lot of airflow. Typical compressors will be measured in horsepower, with ranges going from as low as 1/20 HP up to 1/4 HP or more. This can correlate to air movement of anywhere from 5 liters/min up to 40 liters/min. Now keep in mind that “bigger” isn’t always “better”. For many applications, having a ton of airflow isn’t necessary and could, in fact, prove to be quite annoying. Examples of this include applying makeup, decorating cakes, or any other application where precision is needed. Beyond this, we also look for the airbrushes that come with the kit. We value high-quality units that also have a nice range so as to make the most of the given air pressure. Finally, we like to see other features that can assist in performance such as efficient modes, multiple speed tiers, etc. 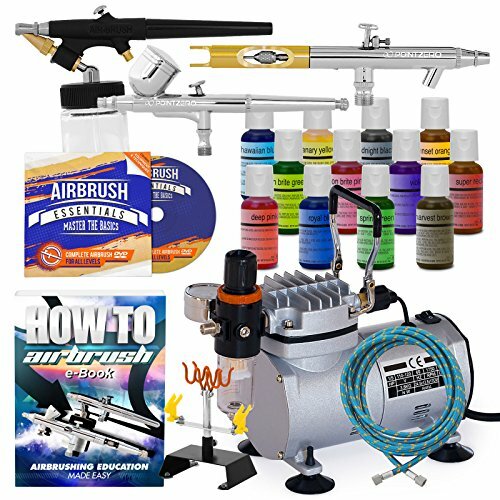 Being a “kit”, we like to see airbrush kits that come with a lot more than just a single airbrush and compressor. We value additional accessories that are common in the more popular kits. This can include things such as paints, brush holders, carrying cases, stencils, operating manuals, etc. In addition, we like to see built-in features such as pressure gauges, quick disconnect adapters, etc. Essentially, we want to see kits that have everything that one would need to get going on airbrushing. Build quality is very important as we consider a high-quality airbrush an investment that needs to last for many years. For this metric, we look for high-quality components such as metal and supporting seals that are necessary to ensure a tight and corrosion-free fit. Also, we like to see careful construction and good fitment between the pieces. Having a reliable and durable compressor is essential to score well here as the compressor is notoriously the most expensive piece and also the one that tends to fail first. Basically, we look for products that give you a good return on investment. Cost is always a consideration in just about every product we review and that is also the case here. Ther can be quite a range in how much airbrush kits cost, with the top ones potentially running several hundred dollars. As we mentioned in other reviews, just because a particular model is more expensive doesn’t automatically mean that it will score worse on the cost metric. Rather, we compare the features, performance, and craftsmanship with other comparably-priced units on the market to find what the best deal for you is. The overall rating takes into account all of the other metrics above and gives us a “big picture” about if the model is worth checking out or not. As a rough rule of thumb, anything scoring a 3.5 or above is a soft recommendation in our book. Anything scoring a 4 or 4.5 is a good recommendation and anything scoring a 5 is highly recommended by us. Items that happen to score below a 3.5 may still work for you but it is on a case-by-base basis depending on your specific wants and needs. These are the full reviews we have performed on each airbrush kit. We break down each model into the specific rating metrics mentioned above and also score them accordingly. The airbrush performance here is about average. The compressor is powered via an outlet and the dual action is designed to handle airbrushes ranging from 0.2 to 0.5mm in diameter. This makes it suitable for smaller items such as toy models, face paint, etc. but for larger things such as car doors or furniture you may find that you want something with a bit more power and spreading capability. There are quite a few fine adjustments that you can make with the compressor and the airbrush that may actually be necessary to find that “perfect” setting to meet your needs. Being an oil-free motor, you don’t have to worry about as much maintenance but it does come at the cost of running hot and likely dealing with friction issues over time, particularly if you run the motor for long periods of time. Many of the typical features we like to see are present, including dual-action trigger, an air/fluid control knob, adjustable needle and screw, and a built-in overheat feature that will help save the motor from destruction (since it is oil-free this is very important). For those after more advanced features, you may be a bit disappointed as everything will require manual tweaking. However, we don’t really mind this and understand that this approach is necessary to keep the price competitive. Nearly all of the components are made of decent quality metal outside of the backside of the compressor which is made of plastic. There have also been reports that some of the components arrive loose and barely screwed on so make sure to check them for tightness upon arrival. As we mentioned above, it is likely that the unit will require some tweaking before it is perfect. The asking price for the ABEST Airbrush Kit is very competitive and an overall excellent value considering what you get. While the kit won’t be able to keep up with professional units on the market, the low asking price means that the barrier to entry is also low. This makes this product great for beginners or those on a tight budget. 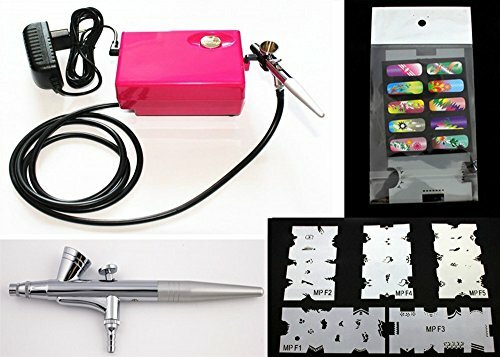 The ABEST Airbrush Kit is a simple and effective unit that is a great airbrush for cakes, face painting, and small models. For larger tasks, we recommend going with something that has a bit higher performance and more features (but also at a higher asking price). This product’s simple approach means that the asking price is very competitive and the reliability and build quality are more than acceptable for this price range. Thanks to the robust 1/6 HP 110-120V 60Hz motor, the performance here is quite good. You get a lot of spray pressure which, coupled with the variety of brush sizes available, allow you to cover both large areas and small areas with ease. Specifically, you can expect up to 58 psi of pressure at 1450 to 1700 rpm. The recommended size of nozzles is also quite large at 0.2 to 1mm diameter. The standard dual-action trigger control mechanism is also installed which we really like as it gives the user good control over just how much paint they are shooting out. This does come at the cost of being a larger, heavier unit and the operating noise is also bumped up some to 47dB. Still, it is relatively practical and can be used in a home setting without major concern. There are plenty of features to enjoy in the AW Professional Airbrush kit. Standard features that we like to see include the dual-action trigger, locked screw for adjustability, gravity-fed airbrush, and more. There are many accessories included that also help with user-friendliness. This includes things such as airbrush holders, nozzle wrenches, eye droppers, storage cases, cleaning brush, and more. This set really is the “total package” for both aspiring airbrush enthusiasts and seasoned veterans alike. Most of this product is made of plastic. While we typically like to see metal used in place of plastic, the build quality is acceptable and should hold up to typical wear and tear. The motor uses is plenty high quality and should operate for hundreds of hours (if not more) without any major issues (that being said, you will need to perform typical maintenance on it). We are also thankful for the inclusion of the built-in Teflon O-ring in the nozzle which helps to fight off corrosion. The only complaint we have to report on are the airbrushes falling apart prematurely. While we definitely prefer this happening over the more expensive motor having issues, it is still something to consider. The combination of higher performance and more advanced features does mean that the AW Airbrush Kit is bumped up a bit in regards to asking price. However, it is still plenty reasonable and should be within most people’s budget. Those who are wanting a more powerful unit that is capable of larger projects will have to be willing to spend a bit extra. The AW Multi-Purpose Professional Airbrush Kit is a fine example of a mid-level package that is very capable in most settings. The motor used is powerful and efficient and, coupled with the 3 included brush sizes, really opens up the possibilities. Several helpful features and accessories are also included the package which also more than justifies the bump up in asking price. Overall, we are very content with this product. The performance of the Badger Air-Brush Co Airbrush Kits is fantastic. While there are a few different sets to choose from, one of their most popular offerings, the 314-AIWC kit, comes with an impressive 1/10 HP oil-free Model 180-10 Whirlwind diaphragm compressor. This compressor is capable of operating at 30 psi and produces great paint application. Instead of having to worry about a huge range of nozzles, the Badger Air-Brush Set comes with a Patriot two angle needle tip that mates with the cone-shaped nozzle. This results in a needle/nozzle configuration that can be adjusted to spray just about any application you desire. It is also very efficient in doing so, helping to minimize overspray and help to maximize how long a can of paint lasts. There are plenty of more advanced features and accessories present here that you just won’t find in smaller kits. We broke down the really innovative Patriot nozzle above. In addition to this, you will enjoy gravity feed technology, dual action capabilities for better control, internal mixing, suction cup feet, and even included instructional DVD. It is important to note that this is a professional-level airbrush kit so the learning curve may be a bit higher than other models from other brands. The construction across the board is exceptional. The components are primarily made of quality metal or durable rubber and they are designed to last for many years. The compressor, arguably the most important component, is an efficient and durable Whirlwind model that can handle many hours of application without issue. Not needing to worry about replacing oil inside is a nice bonus as well. All Badger Air kits are constructed proudly in the USA so you know that the quality is up to spec. You can also take advantage of much more timely and helpful customer support in the rare case that you do have any issues. The primary hurdle associated with Badger Air-Brush Co Airbrush Kits is the high asking price. These are professional-caliber airbrushes and you will have to pay a high asking price to enjoy them. However, their diverse range of applications from being one of the best airbrushes for taxidermy to being one of the best airbrushes for birthday cakes means that you can and will get a lot of use out of them. If you are someone who plans on using your airbrush for large-scale projects then the high asking price should only be a minor concern. We are really impressed with what Badger Air-Brush Co has to offer with their premium kits. The power output is more than adequate and despite having a great color application, the unit is still efficient and relatively quiet. Build quality is excellent and there are plenty of features and accessories to meet most people’s needs. Yes, it does have a very high asking price but for those after one of the very best, the price is more than justifiable. The air output here is about average if not a bit on the low side. This is primarily because of the somewhat small compressor that only inputs 0.6A at 100-250V and output 12V at 1.6A. The result is around 25 psi of maximum pressure. This is fine for covering small areas but for those wanting to paint their car and/or large furniture, you may find that it takes too long to cover the application area. The airbrush size included (and the size that this product is really designed for) is just 0.3mm. This means that you will have great control and be able to deal with intricate details with ease but larger areas will be somewhat burdensome. Most of the standard features that we expect to see are here, but not much more than that. 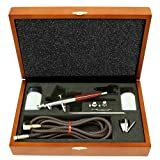 The dual-action application airbrush is included as well as a helpful brush holder, storage case, air filter, and eye droppers. However, the wide array of various airbrush sizes and/or self-adjusting airbrushes is lacking and you will have to buy these separately. Nearly every component here is made of a non-metallic material. While there is nothing inherently wrong with plastic or rubber, these materials are more susceptible to tearing or cracking. That being said, we have heard no reports of there being quality issues so it is basically a non-issue. The motor is small but durable and should be reliable for quite some time. The nozzle included is also a bit on the flimsy and small side but for this price point, we just can’t be too picky. As you might have guessed, the asking price for the Cafego Airbrush Kit is very competitive compared to other all-in-one packages out there. No, you won’t get all of the accessories, included colors, and high performance of many of the more expensive kits but you will get a reliable product that is great for beginners or for someone that just needs an airbrush that is easy to learn to use for small projects. The Cafego Airbrush Kit tries to compete in the lower-end market for airbrushes and offers up some good justifications for why it is worth a try. The power output, while a bit low, is fine for small tasks and the lack of bells and whistles means that just about anybody can pick it up and learn how to use it within a few minutes. The biggest selling point here is in the asking price, which is very competitive. The motor used is a 1/5HP piston type that is oil-free and runs at between 1450 and 1700 rpm. We actually had to do a double take when we saw the power output. That is a huge motor compared to many other airbrushes we have come across. It runs at 47db which is somewhat loud but still can be suitable for a home environment. For versatility, it comes with 3 different airbrush sizes: a 0.3mm, 0.35mm, and 0.8mm. This means that it can handle just about any application or project you can throw at it and this truly is a professional-grade airbrush kit. We really like the “all-in-one” package approach that Comie utilizes here. The lovely carrying case comes included with things such as airbrush holders, nozzle wrenches, multiple adaptors, eye droppers, and much more. There aren’t a lot of built-in features associated with the spraying so you will have to practice to make our application perfect. We actually don’t mind this as most professional airbrushers probably prefer to have their own hands be what is in control. Really the only thing that we found to be missing was accessories to assist with cleaning the airbrushes. The build quality is very nice. The motor is rather industrial-looking but what it lacks in looks it more than makes up with in durability. The motor is tough and can run for many hours without issue. Also being oil-free, the maintenance requirements are lower. Many of the other components are also made of metal instead of plastic which we always like to see as the metal seems to hold up much better over time. While not the cheapest on the market, for the performance levels and packaging you get with the Comie Airbrush Kit, the asking price is more than acceptable. This truly is a professional-level airbrush that can be had for a very reasonable price. Comie really surprised us with their effective and powerful airbrush kit. The motor is huge and, coupled with the 3 included airbrushes, can span great areas of canvas or handle intricate details equally well. Outside of the paint, just about everything that you would need are included in the kit (outside of cleaning supplies). The price, while not on a budget level, is perfectly adequate for the great overall package you get. We highly recommend this product. Since we don’t have a motor or compressor to discuss with this kit, we will focus instead on the airbrushes. The CNUALV SP180K comes with 3 sizes: 0.2mm, 0.3mm, and 0.5mm. This is a great selection of smaller, more intricate airbrush but we do wish that they would have included a larger size that can cover larger areas in a sweep. We are glad that they have the dual-action trigger which helps to have much better control over the content of paint and air that you use. Speaking of air, this airbrush is limited to 15 to 50 psi. This is about what you would see with a traditional kit that includes a pump. The included airbrushes are actually of very high quality and come with many small built-in features that allow them to be very easy to use. Other contents included in the kit include a nozzle wrench, eye dropper, fast joint, air hose, and oil/water separator. You won’t find any of the more exotic or advanced features that you have seen on other higher-end and more all-encompassing kits and the fact that there is no pump included obviously limits any pump-related features that the kit could include. However, for someone with an airline and that isn’t worried about anything but a functional airbrush, this set can still suffice. The various parts are of acceptable quality. We have heard no reported issues of pieces breaking prematurely and we haven’t experienced any ourselves, either. The one main benefit of not having an air pump is that this means there is one less thing that can break. Since an air pump is oftentimes the weak point in an airbrush kit, taking that item out of the equation means that the rest of the parts’ durability and build quality can shine. With proper maintenance and cleaning, you can expect these components to last for many years of use. You will immediately notice that the asking price for this kit is much lower than most of the other examples we have looked at. However, it is important to remember that it doesn’t include a compressor (which is typically the most expensive component in an airbrush kit). Some people have opted to use the CNUALV airbrush simply because it is a good product and then source out a pump elsewhere. Obviously, this would drive up the total cost, however. The CNUALV SP180K Airbrush Kit is a well-performing unit. The components are high quality and the simple and effective approach may be refreshing to some. We do wish that there were some larger nozzle sizes, however. Also, the fact that there is no compressor included in the kit will be an instant deal breaker for many. However, for those who have air hoses installed at their house, you can benefit from the cost-savings and increased reliability of a compressor-free kit. The Ebest Airbrush Kit is powered by a relatively small 12V motor that inputs 100 to 240V at 50 to 60Hz and output 12V at 1.5A. This produces around 7.5L/min of airflow and a maximum pressure of 25 psi. This is a bit on the low side compared to many of the other examples we have tested in this review. 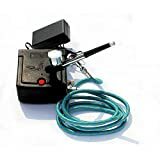 If you are looking for the best airbrush for nails or something similarly small this may work but for larger applications, you simply won’t find enough power to produce the results you are looking for. The manufacturer recommends airbrush sizes from around 0.2 to 0.5mm and includes a 0.3mm airbrush in the kit. There aren’t a lot of features to be had here and it is apparent that Ebest wanted to produce a simple and low-cost kit that is not adorned with tons of features. Within the kit, you will get an adaptor, air hose, airbrush holder, eye dropper, and nozzle spanner. What accessory that is included in this kit that won’t don’t see hardly anywhere else is the 5 reusable airbrush stencils. This is a nice addition and it further reinforces that this unit is really designed for nails. Being a budget item, the build quality may not be up to the caliber that you see in other, more expensive airbrush kits. Plastic is used in a lot of places where you may see metal being used in other kits and the motor is somewhat weak and didn’t go through the high-quality standards of other more expensive examples. You will still get plenty of use out of this product but don’t expect it to compete with some of the professional airbrushes on the market. A great benefit of keeping things small and simple is that it results in a very competitive asking price. The Ebest Multi-Purpose Airbrush Kit is among the most affordable examples you will find that includes its own power source. 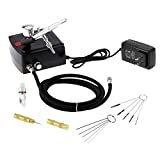 This makes it great for beginners or for children who want to try learning to airbrush without the big initial investment from their parents. It also makes this product a good gift for Christmas or birthdays. The Ebest Multi-Purpose Airbrush Kit is a viable entry-level kit that is designed for smaller applications, specifically nails and potentially makeup. Everything is shrunk down here, from the small motor to the small airbrushes. Because of this, larger applications will be tough with this unit. Build quality is fine but it won’t hold up to the wear and tear of more expensive, professional units. This is a good entry-level airbrush for your kid or for someone who is on a tight budget. Since there is no compressor or motor, the pressure will have to come from an external air source. Typically, these types of air sources provide excellent pressure but obviously, not everybody is going to have one available to them. If you do happen to have it available, you will enjoy anywhere from 15 to 50 psi of air pressure which is plenty for nearly all applications. The kit comes with 0.2 and 0.5mm needles which are on the smaller to medium side of the scale. We do wish that there was a larger spray needle to better take advantage of the good air pressure available. As you have come to expect, the dual-action trigger is installed which gives you a good balance between paint and air. As for accessories, you get 3 different cup sizes (2cc, 5cc, and 10cc), a nozzle wrench, two different nozzles, two different jet needles, and joint converter, and an air hose. We do wish that Gocheer would have included a better carrying case as well as cleaning supplies in their kit. Also obviously missing are any features associated with the compressor as there is not one in this kit. The build quality is about average. The components appear to be of acceptable quality and the materials used, while a bit on the light side, seem to hold up to typical wear and tear. The main thing that this product has going for its reliability is that it doesn’t have any compressor (which is notorious for being one of the most common pieces to fail early on). You can expect this unit to last for several years without any major issues. As you might expect, the asking price is very competitive since it is missing one of the most expensive components (a compressor). This is great for those on a tight budget and that have access to an air source. But for everyone else, you will be forced to find some sort of air compressor which will bump up the asking price quite a bit. The Gocheer Airbrush Kit is very polarized in that it is designed for those with air sources. The unit does a good job of performing and taking advantage of the air and you can use it for a wide variety of applications. You are a bit limited in nozzle size, however. A 0.7 or even 1mm nozzle would have been a welcome addition. Either way, this unit will be very affordable since it doesn’t include a compressor. The performance of the GotHobby Airbrush Kit is extremely good. The compressor is 1/6 HP and is powered by a 110-120V/60 Hz input. This results in pressure ranges of 30psi up to 45 psi and air flow of around 20 to 30 liters/min. At these numbers, you are moving enough air to apply a lot of paint. This makes the GotHobby unit for everything from makeup and model application up to much larger projects including cars, doors, and cabinets. There are a series of nozzles to choose from, ranging from the 0.3mm gravity feed dual-action up to the huge 0.8mm siphon feed single-action. This airbrush really has everything the aspiring professional would need. We are incredibly impressed with the host of features that you enjoy with this unit. It has both siphon feed and gravity feed capabilities (something we aren’t used to seeing). In addition, it utilizes both dual-action as well as single action. This gives you a huge amount of flexibility in how you approach your next project. The compressor is also quite nice and displays the pressure gage right on the front and overall looks the part of a professional airbrush. Furthermore, we really like the quick disconnect that makes swapping between different brushes quick and easy. Finally, there is a helpful H2Holder which holds up to 4 airbrushes. The build quality of the GotHobby Airbrush Kit is also indicative of a pro-level unit. Nearly all of the components are made of quality metal and you won’t find manufacture shortcuts anywhere. There is nice, beefy rubber where necessary which helps to ensure a nice seal and minimize the change for corrosion. Simply put, we really like how well-engineering the entire kit is and you can tell that a lot of thought and effort when into its design. As you can likely tell by now, GotHobby really loads you up with great performance and features. The negative of this? The high asking price. You will pay quite a bit more for this product compared to other airbrushes on the market. But it is targeted at pros or people who need to do large-scale projects and for them, the asking price is reasonable. The GotHobby Professional Airbrush Kit is one of our favorite examples we have tested. The performance is fantastic thanks to the large compressor and the diverse range of airbrushes that come with the kit. Beyond this, the craftsmanship is fantastic and should hold up to any wear and tear that you can throw its way. Yes, the asking price is a bit higher than most other examples, but if you are after one of the best products out there then it should be nothing more than a drop in the bucket. Simply put, you will be hard-pressed to find a more impressive unit in terms of performance. The GCK03 is powered by 1/8 HP Mini compressor that you simply plug into the wall (120V outlet) and let it rip. There is no need to worry about filling it up with oil or dealing with lengthy maintenance procedures. Despite the large and powerful compressor, the operation is surprisingly quiet thanks to the optimized near-silent design of the piston-style compression. This unit is strong enough to work with a variety of airbrush sizes and specifically comes with an adjustable 0.3mm nozzle. You will have great control over your application thanks to the double action piston style trigger that is easy to use. This product is great for people who are after the best airbrush for cars or other large objects. There are many features and accessories present here that you will likely not find in very many other units on the market. 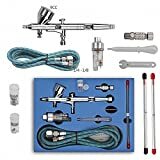 These include things such as moisture trap, air regulator, a micro air control valve, quick disconnect for airbrushes, quick-fit needle cap, nozzle, wrench, and it even includes some paint with the kit. The only accessories that appear to be somewhat lacking are a larger selection of nozzles. You are stuck with the 0.3mm nozzle but thankfully it has some adjustability so you will still have plenty of control over your projects. Grex offers conversion kits that allow you to switch to smaller and larger needles as you need. The build quality with the Grex GCK03 Airbrush Kit is simply fantastic. It is made of high-quality materials that are designed to last for years. When you are spending this kind of money on an airbrush, you expect your investment to be up to the challenge, even in large-scale projects that might exhaust smaller airbrushes. This unit is more than capable. Specifically, we really like the nice housing that surrounds the compressor and provides excellent protection from the outside elements and even bumps and drops. The compressor is oftentimes one of the most sensitive and fragile components on these kits but that concern is minimized here. The Grex GCK03 Airbrush Kit is a very expensive unit. It will be one of the more expensive airbrushes you come across and really is designed for those who are ready to take their skills to the next level. If you are somebody who is looking for a simple airbrush for painting faces or small crafts then there are more simple, less expensive units that can handle the job. But for those who want the best and are willing to pay, then this model may be perfect for you. We are extremely impressed with all aspects of Grex Airbrushes and this particular model is near the top. The performance is fantastic thanks to the huge, reliable compressor and helpful features. You will have to outsource additional nozzle sizes but the included 0.3mm is still very capable. The high asking price may be a turnoff to some but if you want the very best you will have to pay. While the performance here is fine for applying makeup, for those trying to use this on larger projects, you may come away disappointed. The compressor is powered by typical 120V outlets and produces airflow from 5.5L/minute up to 7.5L/minute at 25 psi. This is noticeably lower than many other airbrush kits we have tested. That being said, it is more than enough for applying makeup (in fact, we prefer the lower pressure since trying to apply makeup with a high-powered brush would be both messy and may even hurt!). The main benefit from the low-powered approach is the lightweight body, lower power requirements, and quiet operation. This is a very bare-bones unit that won’t have most of the features and accessories you may be used to seeing. Essentially, you get a compressor, small brush, and the plugin. Missing are things such as pressure gauges, easy-snap fittings, additional nozzles, carrying case, etc. You won’t find any high-quality metal components or carefully-constructed pieces. This unit is designed to be competitively priced and one of the sacrifices it had to make was in the materials used and overall build quality. That isn’t to say that it won’t perform. However, you may find issues arise after a year or so of use. Specifically, we have heard complaints about the nozzle losing some of its accuracy over time and over spraying. This could be quite frustrating if you are trying to carefully apply makeup. This is an extremely affordable unit and one of the most wallet-friendly complete Airbrush Kits you will find. However, as we have made very obvious, you sacrifice quite a bit in both performance and features to achieve the asking price. If you are after a simple and cheap solution for applying makeup for a Halloween costume of a party then this will work but for those who want “more”, you will likely have to spend more to find a more formidable unit. 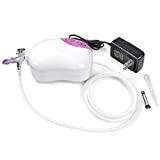 The HUBEST Airbrush Makeup System Kit is an entry-level solution for those who specifically want to use their airbrush for makeup application and that don’t want to spend a lot of money to achieve it. You won’t get the eye-opening performance or huge list of features here but the asking price makes it easy to overlook some of that. We can honestly say that there are much better products on the market but this piece certainly has its place and specific applications. Performance is very good thanks to the powerful yet quiet Smart Jet Compressor with auto-shut off. This compressor is much more powerful than many other examples on the market so no matter how big of an arts and crafts task you have in mind, it is sure to be able to handle it with ease. The Iwata-Medea Deluxe Airbrush Kit comes included with a 0.35mm nozzle. This is a bit on the small side but since this unit is targeted towards paint application for makeup and models, you want something that is precise and has good control. The typical dual-action nozzle is also included which allows you to have a nice balance between paint and air output. In terms of features and accessories, this product is among the best we have come across. There are tons of extras included that really make it the total package. This includes the pistol grip air filter, 8 oz airbrush cleaner, 10 bottles of Medea Com-Art Color, stencils, instructional DVD, conversion nozzles, and a freehand template. This is great for those who want everything that they need in a single package. However, for those who already are familiar with how to airbrush, the extra learning material may be overkill and not be worth the increased asking price. We are very impressed with how much detail and effort went into assembly this kit. The compressor is very reliable and should operate for hundreds of hours without concern. The airbrush included is one of Iwata-Medea’s in-house examples (which they are known for) and should provide excellent user feedback while being reliable and resilient. The tight construction helps to minimize moisture that can enter and escape which will help with minimizing rust and corrosion over time. Finally, this unit is backed by the impressive 5-year Iwata-Medea warranty which is one of the best in the industry. You will pay a hefty premium to enjoy this large airbrush set. While Iwata-Medeas airbrush products tend to migrate towards the premium price tier to begin with, the fact that it includes many extras including a vast color supply drives up the price you will pay even further. You will get a proven and capable package here but it simply may be more than some are willing to pay. The Iwata-Medea Airbrush Kit is a great addition to the premium airbrush category and it can hang with the very best. 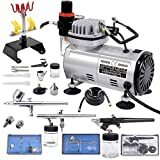 The huge compressor produces great pressure and allows for the user to have plenty of freedom in what and how they color their favorite craft projects. We are also extremely impressed with all of the great extras that are included in this kit, making it one of the few examples on the market that you can truly open up and have everything you need to get started. However, it does come with a big price tag that may be more than a lot of people, particularly beginners, are willing to pay. But for those with deep pockets, you won’t be disappointed. 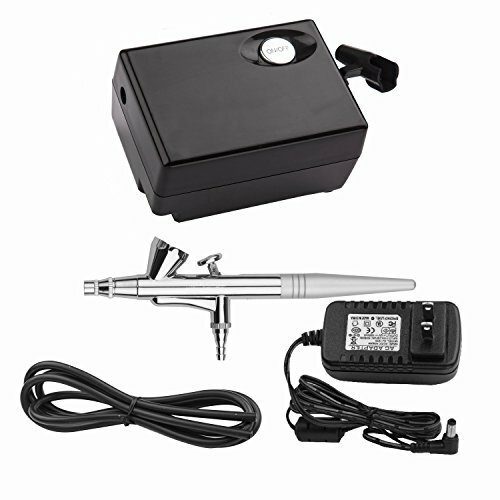 The compressor included in the KKmoon Airbrush Kit is a proven AC-18 compressor. This oil-free unit operates at 1750 RPMs and is capable of producing up to 25L/min of air movement. This is a very impressive number and at rates like this, you can achieve all sorts of goals. Applications include spray tattoos, nails, artwork, crafts, car components, and much more. Even more impressive than this is the 3 different nozzles you get with this kit. With the purchase of this set, you will receive the T135A (0.2mm needle with 2cc gravity fluid cup), T130A (0.3mm needle and 7cc gravity fluid cup), and T138A (0.8mm needle and 2 – ¾ oz siphon bottle with 1/8” air inlet). This is a fantastic array of options to choose from and really opens up the capabilities that this KKmoon unit can achieve. As we discussed above, we are blown away by the awesome 3 airbrushes that are included in the KKmoon Airbrush Kit. Beyond this, there are other great features. These include the water release valve, portable carrying handle, removable needle/nozzle cap, built-in Teflon O-ring, 5-piece mini cleaning brush set, and even a user manual. A nice bonus is that each airbrush component comes in its own attractive carrying case. All in all, this makes for a fantastic package. The craftsmanship of this assembly is quite good from what we have gathered. The main selling point is in the proven airbrushes that have been shown to work for hundreds of hours without issue. The compressor is outsourced by comes from a reliable and proven brand. The added features such as o-rings and quality metal/rubber components combine for a very reliable and resilient unit that can handle both personal and professional applications. You will pay a higher than average asking price for this product but it is still noticeably more affordable than quite a few other professional-caliber units on the market. Sourcing 3 different airbrush sizes made from quality manufacturers will easily add up to being what you would pay for many other kits so the fact that you get all 3 plus a proven compressor actually makes this a bargain in our book. KKmoon was a relatively new brand to us but overall they really impressed us with their great kit. The biggest selling point for us is the three great airbrushes that come in very different sizes and allow for a wide span of applications. 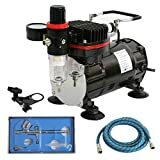 Combine this with the reliable and powerful compressor and you have a product that really can handle just about any task you can throw at it. You will pay into the premium price tier here but it is well worth it considering everything that you will get. This is a powerful and efficient unit that has a robust compressor to back it up. Specifically, the compressor you will get is a Model TC-20. This is a popular and proven unit that produces 1/6 HP and delivers up to 25 liters/min of air. This is plenty for just about any application you can think of from small to large. For its power source, plug it into any 120V outlet and you will enjoy the 15 to 45 psi of working pressure. As for the airbrushes, Master Airbrush has packaged 3 proven and effective airbrushes in this kit. It includes the G22 Airbrush (0.3mm gravity fed needle), G25 Airbrush (0.2mm gravity fed needle), and E91 Airbrush (0.8mm air inlet needle). This is a huge range of needle size and you are sure to find a brush that will work best for you. This really is an all-in-one kit and one of the most extensive in the industry. 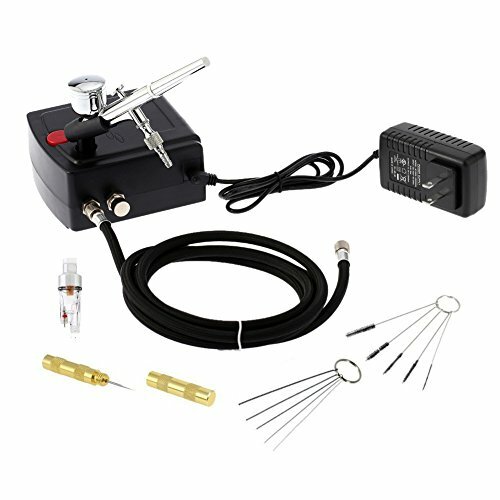 Obviously, you get the great compressor and airbrushes mentioned above but there is much more. You also get a 4” color mixing wheel, a compressor mounted airbrush holder, 5 piece mini cleaning kit, operating manual and guide booklet, and even 6x 1oz bottles of color. You can also enjoy the dual action trigger, pressure gauge, and quick disconnect fittings that we like to see on higher end kits. The build quality is very good and it is obvious that Master Airbrush cares about its reputation. The compressor is very reliable and the airbrushes look and feel well put together. There is metal and quality plastic components used throughout and you can expect these parts to operate correctly for many hours. The only minor issue we have heard people having is with the line occasionally clogging. However, timely maintenance and cleaning should help alleviate this problem. While there are more affordable examples out there, none will have the combination of performance, accessories, and build quality as the Master Airbrush Professional 3 Airbrush Kit. Furthermore, there are many kits that actually cost more than this one that can’t deliver at the same caliber. For those reasons, it is much easier to overlook the somewhat high asking price. The Master Airbrush Professional 3 Airbrush Kit is easily one of our top choices for a beginner all the way up to an aspiring pro. 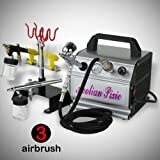 If you are looking for the best airbrush for makeup, best airbrush for furniture, or the best airbrush for just about any other application then this model is the solution you are looking for. It has a great variety of helpful accessories and features, has great performance, and is very reliable. This is a home run purchase in our book. A somewhat similar 1/6HP compressor that we are used to seeing in many other higher-end kits is included here. The performance, while good, is a bit lower than some of the other comparable compressors. You will see around 20-23 liters/min of air output through the 1450 to 1700 rpm operation speed. This is still plenty strong for nearly every task, even large ones such as furniture, doors, etc. The big shining point is with the collection of airbrushes that you will receive. You actually get 3 different sizes with this kit: The AC0041 (0.3mm gravity fed dual action), the AC071 (0.8mm bottom feed single action), and the AC073 (0.2mm gravity fed dual action). This is the type of range we look for and gives the OPHIR kit huge bonus points in our book. We love the nice selection of features at your disposal. Not only do you get 3 different airbrush guns discussed above, but you also will receive 5 cleaning brushes, a cleaning needle, air filter, mini airbrush holder, and a quick start guide. The compressor unit also contains a carrying handle, pressure gauge, auto-stop function, and much more. This is above average even for professional airbrush kits. We found no issues with the build quality of this kit. All of the components appear to be carefully manufactured and assembled and small things such as quality fittings and rubber are in places where it needs to be. The compressor has proven to be reliable and produces nice, consistent air flow that makes the application much easier. The air guns are imported but seem to be nice as well: metal is used in place of plastic in most places and corrosion concerns are at a minimum. For everything discussed above, you will pay a somewhat lofty fee. While not the most expensive kit we have come across, it is certainly up there. That being said, you do get a lot for this price and we don’t feel that OPHIR is asking too much. The OPHIR Airbrush Kit is a great professional caliber unit that can hang with some of the best out there. The compressor puts out acceptable power and is reliable to boot. We really like the 3 airbrush guns that are included that the nice variety of needle sizes that they possess. The other accessories are diverse enough to catch our attention as well. It is a bit higher in asking price, however, so those after a simple product for doing makeup or small model pieces may not want to spend this kind of money. As the name suggests, this product utilizes a double action airbrush that takes advantage of an airline. You will enjoy great control with your application and can vary your spray from 1/32” up to a huge 1 ½”. This really opens up the various applications that you can work with. The secret to this is the inclusion of three different spray heads. This is a bit different than many other kits that come with 3 different brushes. The heads are simple to screw and unscrew and all fit on the same part of the main housing. Specifically, you will receive a VLST#3 airbrush and size 1 and 5 spray heads. There are a couple features worth noting. The double action capability is always a great addition and basically essential for anybody who wants good control over their projects. The spray heads discussed above really open up how narrow or wide you want to go. Beyond this, you will receive a ¼ ounce metal cup, 1-ounce bottle assembly, 1-ounce storage bottle, wrench, hanger, and a lesson manual. Another great addition is the very attractive wooden carrying case that most of Paasche Airbrushes come in. Not only does it look great but it always provides vital protection for your investment. Simply put, Paasche Airbrushes are fantastic in regards to build quality. You will instantly tell that they are a step above the rest of the competition when you see them. The quality metal and plastics used give off a sense of quality and they are extremely resilient to typical wear and tear. Furthermore, you can relax knowing that these products are proudly made in the USA and come with a fantastic manufacturer’s warranty. Also, since there isn’t a compressor included with this kit, it takes away a common weak point in most airbrush kits. These are pretty expensive products. While they look and perform great, you do pay a premium for the attractive styling, quality parts, and added benefit of being made in the USA. This is one of the few airbrush kits that may actually turn heads when you use it due to how great they look and for people that plan on using this in high traffic areas or places where they want to look the part, this might be an added bonus and worth the upcharge in price. 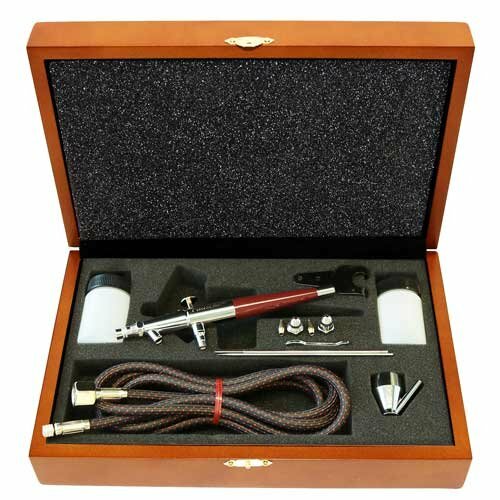 The Paasche Airbrush Kit is one of our favorite units we have tried that take the compressor-free route. The entire kit looks great and you can tell that a lot of love and attention went into outsourcing the materials and assembling them. There are enough features to meet most people’s needs while still being simple to use. Not having to keep up with 3 large guns and instead just having small nozzles is a nice touch in regards to mobility. And we love the included carrying case and how it really brings the whole kit together. The power source is a small DC air compressor that can push out 0 to 25 psi. Considering the small demeanor of the compressor, this is actually not a bad rating. However, Pinkiou has stated that they operate their makeup application in the 5 psi range which makes this small unit more than adequate. As for the specifics of the compressor, it is powered by 12V DC and flows up to 7.5L/min of air. You are a bit limited in your spray guns with the only choice being the included 0.4mm nozzle that is only single action. We suppose that if you are only going to offer a single nozzle that 0.4mm is a good choice as it finds a “happy medium” between size and accuracy. Being a budget unit, you aren’t going to have a ton of features like you would with pricier examples. We definitely wish that a dual-action trigger was included instead of the single-action as this has sort of become the industry norm. Furthermore, the compressor doesn’t include any sort of pressure gauge. What you will get with this kit includes a brush holder, a storage case, and an instruction manual. Considering the great price, we can’t be too picky. There have been several reported issues with this product. Many of them involve paint clogging. This can be caused by many factors but the common theme that we have seen is that lower-cost kits tend to suffer from this more than higher-cost examples. Also, you won’t find nearly as much high-performance metal as on other units and instead will mostly work with rubber and plastic. For simple makeup applications, it may work for a while but we would be leery of attempting larger-scale operations with it. The top selling point of the Pinkiou Airbrush Kit is its competitive price. For those on a tight budget or not needing all of the extra bells and whistles that are on more expensive units, the low barrier to entry here will be very attractive. But you do sacrifice quite a bit in the way of reliable air output and features to achieve it. The Pinkiou Airbrush Kit focuses on the low-end sector of the industry and we find nothing wrong with that. Some people just don’t need the extra performance and/or don’t want to pay the premium price tag for it. If you are just looking to apply some makeup or do some nails then this kit should work for a while. However, there are some noticeable quality control issues that may pop up after a short while. The air pressure is distributed from a rather large and robust 1/5HP Elite-125X compressor that is capable of around 1 CFM of air movement. This is a huge compressor and among the largest that we have come across. Because of this, we actually question why PointZero focuses on “just” cakes for this product. It is powerful enough to handle makeup, arts and crafts, and much more. There are also three different airbrushes to choose from in the kit. The PZ-258 is a dual-action, internal-mix airbrush with a .35mm nozzle. 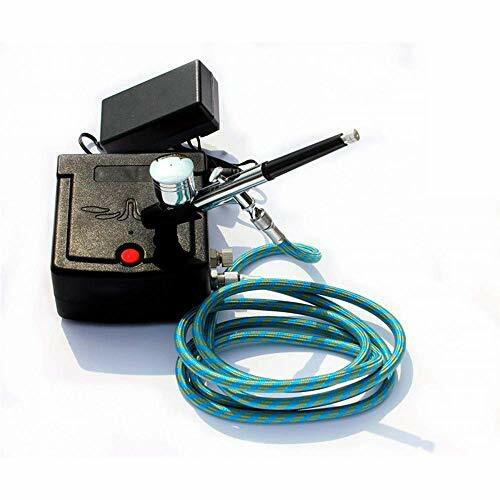 The PZ-260 is a dual-action, internal-mix airbrush with a .3mm nozzle. And the PZ-276 is a single-action, external mix airbrush that is designed for spray patterns between ¼” and 2”. This is a huge array of brushes and really helps to maximize the impressive power output of the compressor. We really like the features and accessories that come with this all-in-one kit. We already mentioned the nice selection of airbrushes and the impressive compressor above. Beyond that, there is an easy quick disconnect design that makes swapping airbrushes a breeze. Other items include the impressive 12-pack of various colors, a tabletop stand, braided hose, glass storage bottles, 5cc and 7cc color cups, nozzle wrenches, and a helpful instruction guide. All of this combines to be one of the largest and most expansive kits we have come across. We have no qualms with any of the components in this PointZero Airbrush kit. The compressor, despite being quick large, is surprisingly efficient and reliable. The spray guns are made of nice metal components and should handle the test of time with minimal concern of corrosion. With proper maintenance, you can expect this unit to last for many years of solid use. Being a large set of many high-quality components, this isn’t the cheapest airbrush solution on the market. That being said, you simply get so many items in this kit that it is still a great deal in our opinion. The combination of the high-performing compressor, 3 different premium airbrushes, and a huge selection of colors makes this a great value. The PointZero Cake Airbrush Decorating Kit is on the short list of our top airbrush sets on the market. The lovely combination of performance, usability, and features make this a home run purchase in our book. And, despite offering all of these things, PointZero still manages to present the set at a very reasonable price that should be within everybody’s budget. Even if you are wanting to do things other than work on cakes, this is a must-have set for your home or business. Due to the small stature of the compressor, you won’t see the levels of air output that you do with larger kits. Specifically, the compressor is a model TC-12 which runs at 0.8 Amps and produces around 15 psi of pressure. There are three different PSI modes but none of them are overly powerful. That being said, it is plenty capable of handling makeup application and small cakes which is what it is intended for. The included airbrush is a 0.4mm nozzle which is a nice medium between size and accuracy. We do wish that there were more airbrush sizes included but this would end up driving the asking price. This is a pretty Spartan unit in terms of design and features. You won’t see all of the gadgets and adjustment options that other, most expensive units may have. That being said, the 3-speed setting on the compressor is quick original and something we don’t see too often. Beyond this, however, the kit is small. You will receive a flexible air hose, manual, and storage case. Beyond that, there isn’t a lot to get excited about. Build quality is acceptable but won’t hold up to the long-term use of most metal examples. The plastic over time simply doesn’t perform at the same level. A common complaint that we have heard is from people saying that the paint will gunk up and jam the unit, making it useless. There may be a procedure for minimizing the likelihood of this happening and it is definitely worth looking into. While you do sacrifice in performance and features, this results in a very competitive asking price that will be among the most affordable on the market. For those starting out or that are on a very tight budget, you may have to settle with a smaller unit like this. The StarsTech Cake Decorating Airbrush Kit is a very simple and low-cost solution to smaller airbrush applications. The small motor lacks some of the grunt of bigger models and you won’t find a lot of the features present in other models as well. However, the asking price is extremely competitive and should fit into even the tightest of budgets. If you want something small and simple without spending a lot this product may work but for everyone else, spend a bit extra and get something more capable. The built-in compressor is a bit on the small side. It produces around 9W of power which allows for up to 25 psi of air pressure. This actually isn’t that bad and is more than enough performance for small tasks. The single airbrush that is included is a 0.4mm nozzle that utilizes a 2cc cup. This is a very standard size and typical for airbrush applications. We feel that a 0.4mm nozzle finds a happy medium between accuracy and spray area. You won’t find a lot of features and adjustability options for this unit. Really, the only feature that stands out is the included moisture trap. This is a great feature as (as the name suggests) it helps to remove moisture which is a common catalyst to corrosion and decreased performance. This unit is made mostly of plastic as opposed to metal but the build quality seems to be decent despite that. We feel that the moisture trap discussed above which significantly help increase the life expectancy of the unit and it helps us to overlook it being made of plastic. With proper care, this unit should last for hundreds of hours of use. 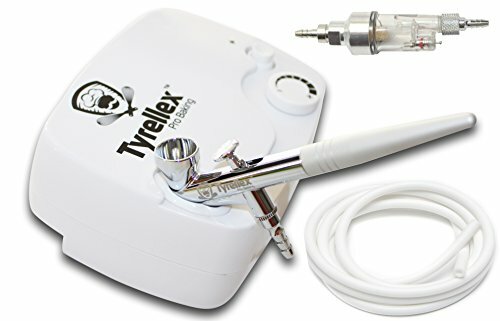 Compared to similar units on the market, the asking price of the TYRELLEX Airbrush Kit is a bit higher. That being said, there really aren’t very many other products that are similar to it. Sure, there are comparable kits in regards to power output and the airbrush size. But the moisture trap, modular design, and unique styling really make the TYRELLEX stand out from the competition in multiple facets. Whether or not this is worth the price increase is up to you. If anything, we appreciate the TYRELLEX Airbrush Kit simply because it tries to do something different. The looks, design, and features (while somewhat lacking) do make it stand out from what can be a pretty mundane and similar product category. However, you do end up paying a price increase for this. From a strict performance standpoint, there are better options for the price but we will give this unit a soft recommendation based on its originality alone. The compressor used here is a huge TC-80 that operates at 1/5HP. This is a huge compressor and among the largest we have reviewed. This big unit can produce working pressure between 15 and 50 psi and has a maximum air delivery of an impressive 57 psi. This results in air delivery rates of 25 liters/minute which is extremely impressive. At this level of air output, you can cover a lot of area of whatever canvas you are working with. The airbrush that is included is the model AB-130A which is a popular 0.3mm needle dual-action airbrush. While we are content with this particular airbrush, we do wish ZENY would have included some other sizes to better take advantage of the immense power of the compressor. Most of the features and accessories we like to see here are, but not much more. As we already mentioned, the lack of additional airbrushes is a definite con. Also missing are self-cleaning products, an attractive carrying case, paint colors, and more. What the set does come with includes 6 feet of air hose and an airbrush holder. While we do wish that there were more accessories, the lack of them does result in a more competitive asking price. The build quality is acceptable here. The TC-80 is a workhorse and runs very quietly and efficiently. This means that you should get a long life out of it before you have to worry about repairs or maintenance. The airbrush is also of acceptable quality and comes from a proven brand that is used everywhere. 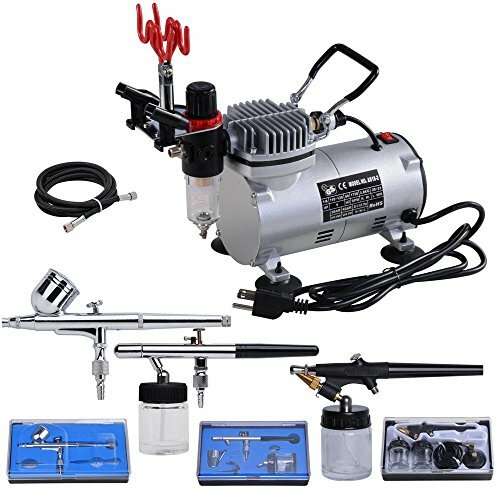 For the huge compressor and quality airbrush you get, the asking price is very attractive. In fact, it will be among the lowest around that offer this caliber of the compressor. However, the lack of additional components is likely a big reason for this low price and quite frankly we would have rather paid a bit extra to get more airbrushes and potentially some paints included. The ZENY Multi-Purpose airbrush cut truly is capable of handling any task, both large and small. All of the components included are of good quality and robust enough for even commercial applications. And the asking price is lower than most other brands can match. However, this results in a noticeable lack of features and accessories that tap into the great compressor. We really wish that there was at least one more airbrush included and a carrying case or paints would have been nice. Still, from a strictly performance and reliability standpoint, ZENY does an acceptable job here. 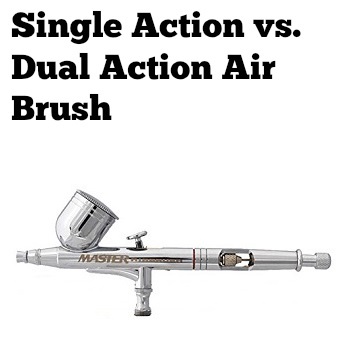 A common source of confusion is in regards to the difference between a single action and a dual action airbrush. We will discuss each below. 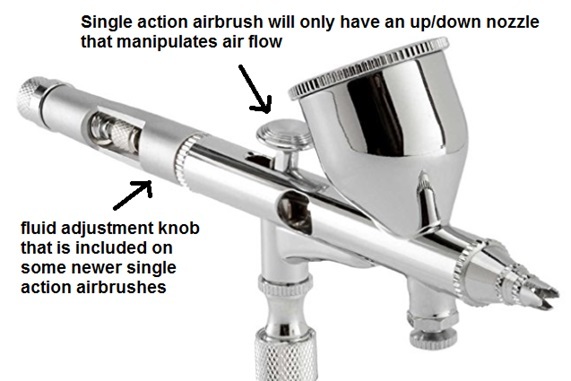 A single action airbrush is a unit that products both paint and air at the same time when the trigger is pushed. A good analogy is a traditional can of spray paint. When you push down on the spray paint can, a consistent level of both air and paint are released at the same time. That being said, airbrushes typically have an added feature that allows you to manipulate the level of air pressure at the compressor. This is how you can adjust the amount of paint that comes out which is extremely important if you are wanting to have better control of your project or canvas. The rule of thumb is that that turning the knob clockwise will decrease paint flow while turning it counter-clockwise will increase paint flow. This means that if you need to adjust the amount of paint, you will have to stop what you are doing and adjust the knob before you can continue. Oftentimes larger nozzles will be single action. This is because most applications that require larger nozzles consist of simply filling in an area with solid color rather than trying to draw or stylize. If you simply want to spray paint a door red, for instance, you don’t care about being able to fluctuate the paint rate at the trigger. In fact, you typically would prefer a consistent and solid spray that doesn’t fluctuate. A dual action trigger gives you much more control over the amount of air and paint that comes out. On a dual action trigger, pushing down on the trigger will produce air from the compressor while pulling back on the trigger will give you increase levels of paint. Instead of controlling the amount of air from the compressor, you will control it directly from the trigger. As you can probably imagine, having the ability to fluctuate how much paint comes out is essential for more detailed areas and if you want to layer. Coincidentally, that is why smaller airbrushes will be dual action rather than single action. Most of the time when somebody is using a smaller nozzle (0.4mm or less), they are after increased levels of color control. Surprisingly, neither is better than the other! Both have their time and place and should be essential parts of any viable airbrush kit. 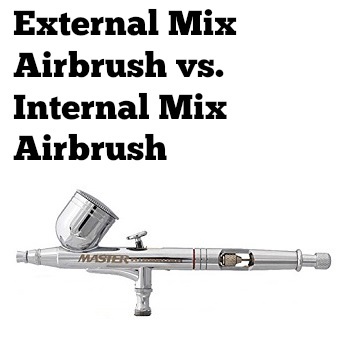 Another common question we receive is what is the difference between an external and internal airbrush system. External – This type of airbrush combines the air and the paint AFTER they exit the tip of the airbrush. You would oftentimes control the volume of paint coming out by a knob located directly on the airbrush. Internal – This type of airbrush actually mixes the air and pint inside the airbrush tip before it is released. There are also noticeable differences between the types of feed technology that is used on an airbrush. 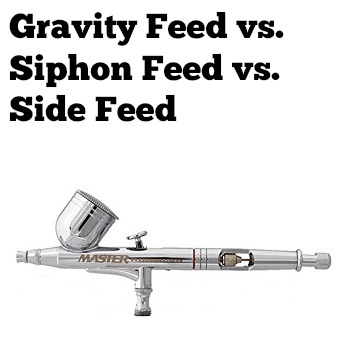 The most common you will see is gravity feed, siphon feed, and side feed. We will briefly discuss each below. Gravity feed – This type of airbrush has the paint stored directly above the airbrush nozzle and uses gravity to transport the paint from the bottle to the tip. Using gravity, you can a consistent and easily anticipated rate which makes it great for consistent control. Typically, you will find that the smaller nozzles are gravity feed (0.35mm and below). Siphon Feed – As the name suggests, this type of feed will use a siphon and built-in air pressure as opposed to gravity to feed paint to the nozzle. The main benefit of a siphon feed is that it greatly increases the size and shape of bottles and cups that you can use. In addition, it also works with larger nozzles which may struggle to receive adequate paint with the gravity feed method. You can expect to see siphon feed anywhere from 0.1mm to 0.6mm and sometimes higher. Side Feed – A side feed actually operates very similarly as a siphon feed. The cup or bottle of paint is attached to the side and can rotate. This gives you much more control as to the angle you apply paint. However, this feature does come at the cost of having reduced pressure, meaning that most side feed airbrushes will be on the smaller side (0.35mm and below). Just because a particular airbrush is good for one task doesn’t mean that it will be good for another. As you might have noticed, certain airbrush kits actually are labeled as being a “cake” airbrush or “makeup” airbrush. That isn’t to say that you technically couldn’t use them for other tasks but rather it may be more laborious or challenging than you might think. Below we will go over some rough traits that you should look for if you are after an airbrush kit for a specific application. We will briefly discuss some common airbrush applications and we hope it will help clear up some confusion. Airbrushes for makeup require great care and accuracy. Because of this, you don’t need an airbrush kit with a huge compressor or an airbrush with a giant nozzle. Rather, you will actually want just the opposite. For makeup, we like looking for airbrush compressors that produce between 10 and 20 liters/min of air. This provides plenty of air movement while not being overly powerful to the point that it is hard to control. As for the airbrush itself, try to stick with nozzles that are 0.4mm and below. This is a small nozzle that doesn’t provide a lot of spread but allows for great user control. Typically, these sized nozzles will be dual action but if you find yourself having to choose between dual action and single action, always go with dual action for the added control. The best airbrushes for cakes are a bit wider than for makeup. While you still want good control, you will typically be applying color to a larger area so having a bit more robust of a spray nozzle can be helpful. Sticking with the 10 to 20 liters/min of air is still good here. This provides plenty of power while still being controllable. The nozzle can be a bit wider (up to around 0.6mm) but we don’t recommend going any higher than this. If you do happen to have a large area that will be colored in a solid color and also some highly detailed areas, you may want to consider buying a kit that comes with multiple sized airbrushes (most of the top kits will have this feature). Finally, stick with dual action. Things get a bit hazier here. The best airbrush for your needs will really depend on the specific application. If you plan on coloring a large structure such as a fence, window shingles, a sign, etc. then you may want to go with a larger unit. However, for smaller things such as pieces of a model, toys, or general artwork, you will probably want to stay with a smaller needle the provides better control. If you can find a kit that not only has multiple sizes of airbrushes but also a compressor with various power settings then you will be set for any application you can throw at it.